The aim of Dancing for Well-Being, above everything else, is to have FUN! The business of getting older and/or having to cope with illness, disability, pain, bereavement, caring responsibilities etc. can knock the stuffing out of us. It’s harder to go out and do activities we used to enjoy in the company of family and friends. We can start to lose our social “muscles” as well as our physical ones. 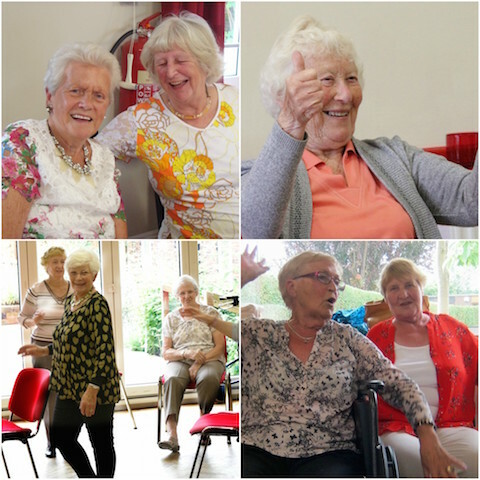 Dancing for Well-Being exercises both sets of muscles as it always generates a lot of chatting and laughing among group members. You may think dancing is beyond you now but we can assure you it isn’t. We try to use music that is simply irresistible so you can’t help wanting to dance to it. You may not dance like you used to but you’ll be amazed at what you can still do. If you’ve always been told you’ve got two left feet or no sense of rhythm so have never danced much, please don’t let that stop you now. With Dancing for Well-Being there are no right or wrong steps, only variations! With most dances we invite you to copy our moves, but there’s no pressure to do so. We encourage everyone to go at their own pace and rhythm, and move in their own individual way. We use a mixture of music from all over the world and more familiar music that you’ll recognize and be able to sing along to while we dance. For some dances we use props, like scarves, velvet elastic, hats and cheerleader pompoms which add to the fun. You can let your hair down, be spontaneous, relax and let the music and movements and companionship lift your spirits.